I just can’t stop using it. I’ve always thought the simplicity of Google Maps made it so useful, but the new Yahoo! 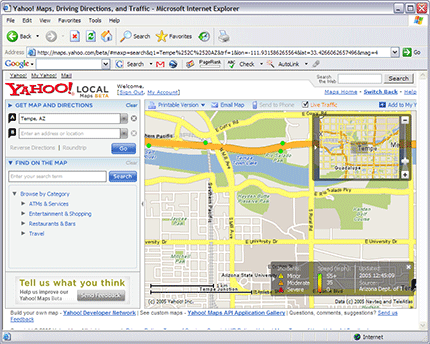 Maps is simple to use, but exposes much more functionality than Google’s mapping product. I like that the the URL changes as you move the map around. Sure Google had that permalink, but it seems like the default should have the URL always updated. I can’t wait to see how the new ArcWeb 2006 functions. I’m still not really sold on Flash, but I’m begining to come on over.